"Project Hydra" was the codename for the Diablo III project and team before the announcement at WWI 2008. Hydra is a Force Wizard skill unlocked at Level 21, summoning a hydra that attacks enemies with bolts of fire. This skill causes a dragon-headed creature to pop out of the ground and fire magical attacks at nearby enemies. The rune effects modify the appearance and damage type in various ways. Among the many secrets of the Ancient Repositories, the Wizard found the Hydra spell to call forth a ward to dispatch of enemies from multiple directions. Refer to the Hydra rune effects article for thorough descriptions of all five rune effects in this skill, including screenshots, videos, strategy tips, and other related information. This was too high level to use at BlizzCon 2009, though players sorely wanted to try it out and see the improvements from Diablo I. Graphical, if nothing else. It's interesting to contemplate what the Hydra (multi-strike) rune would have done to Hydra. More than 3 heads per cast? Plus, Greek Mythology fans could geek out. Especially if they named their character Learnean. Hydra in action. Un-runed. October 2010. 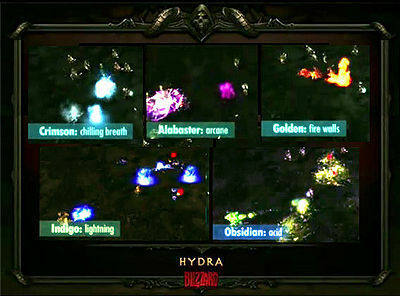 Hydra was first shown at BlizzCon 2009, where it was on the Conjuring Skill Tree at Tier IV. Unfortunately, it was too high level to select in the gameplay demo. You could only have one Hydra active at a time, and it had a slow firing rate. Like Meteor, it was useful to stick these out there to let them ping away, hoping the damage would add up over time. They were very commonly used near the end of rounds, when one or two characters were chasing one on the other team. Most Wizards would cast Hydras in the path of the fleeing enemy, knowing they’d get in a shot or two and help finish them off. Skill tiers were removed for the July 2011 Press Event, allowing skills to unlock steadily from levels 1 to 30. Consequently, all skill levels were adjusted and Hydra became a level 19 skill. Hydra remained at level 19 when the beta started. With the Patch 13 changes, it was classified as an Arcane skill and moved to level 20. For March's Beta Patch 14, Hydra was moved to level 21 and nerfed just a bit. Also, the category "Arcane" was renamed to "Force". See the Wizard skill archive for more details on previous versions of Hydra and other Wizard skills. Or see Hydra (BlizzCon 2008) for the original version of this skill. The hydra spell was originally seen in Diablo I, then called Guardian. The principle was that three heads were summoned from the ground, shooting firebolts at enemies for a limited time. They are more fun to cast than efficient at killing anything with. 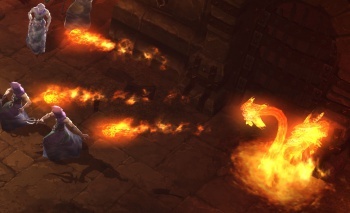 In Diablo II, they were turned into flaming heads, and got the name Hydra. While not dealing damage to anyone near the flames, their firebolts are of more use, especially if concentrating the fire on single targets at a time, and alternating skills while waiting for the cooldown. Hydra was the codename for the Diablo III project and team before the announcement at WWI 2008. Arcane and Original version comparison. Hydra made Arcane by rune. This page was last edited on 16 April 2015, at 17:52.